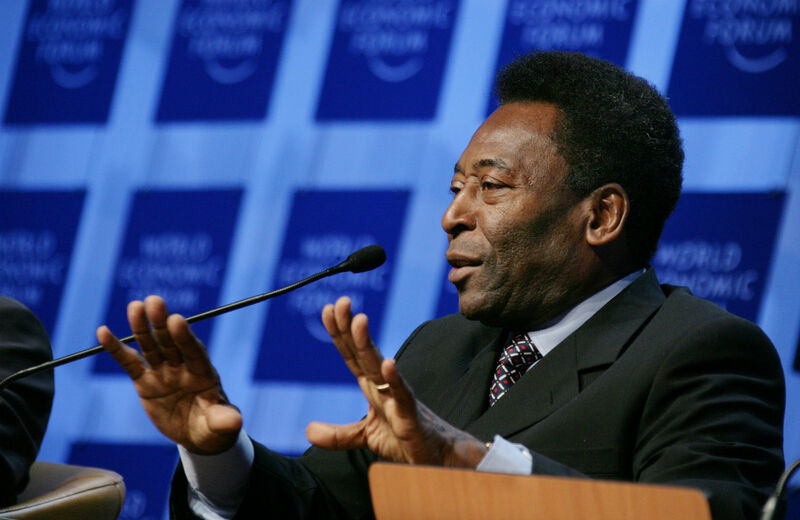 Brazilian soccer legend Pelé has long loathed the political spotlight. He grabbed it this week to criticize the very World Cup he helped bring to his country. Dave Zirin has a book out next week called Brazil’s Dance with the Devil: The World Cup, the Olympics, and the Fight for Democracy. His travels to Brazil and work on that project inform much of this article. By criticizing the 2014 World Cup and the spending priorities of the Brazilian government, soccer legend Pelé has accomplished the rarest of feats in twenty-first-century sports media: he has shown the capacity to shock and surprise. These comments are without question tepid given the scale of the assault taking place on Brazil’s poor in the lead-up to the World Cup. It also ignores that much of the violence has been perpetrated by the Brazilian military police, who merit nary a dollop of criticism from the 73-year-old legend. What is remarkable is that Pelé said anything at all. There is a reason why Brazilian soccer star turned politician Romário once said of the soccer legend, “He is a poet when he does not speak.” Romário said this because Pelé has never failed to plant himself on the wrong side of history. Pelé was there arm-in-arm with Brazil’s former President Lula da Silva when Brazil secured the World Cup for 2014 and the Olympics for 2016. To hear him raising actual criticisms of how the money has been spent is akin to Michael Jordan taking a stand against labor abuses perpetrated by Nike. After all, this is Pelé: the first athlete to ever trademark his own name. This is Pelé, who as a brand and a blank-slate superstar athlete, was both ahead of his time and out of touch. This is Pelé, the person who said last year, as rubber bullets were flying and tear gas was being shot directly into the eyes of demonstrators and bystanders, that people should stop protesting and ”think about the national team.” This is Pelé, who advised that demonstrations should be postponed until after the Cup and was roundly jeered. This is who Pelé is. It is also who Pelé has always been. In the 1960s, when “the revolt of the black athlete” was on everyone’s lips, Pelé was criticizing Muhammad Ali for resisting the draft and refusing to fight in Vietnam. In an era where the rulers and rules of the world were being challenged, Pelé met and entertained European royalty. He allowed Brazil’s dictatorship to use his image on postage stamps and went on “goodwill tours” to newly independent African republics on behalf of whichever of the rotating dictators happened to be in charge. He dressed in African garb, celebrating a Brazil in which the position of the Afro-Brazilian masses was dire. It is not that Pelé was a hardline, heartless right-winger, as much as he was someone who chose to risk very little. The Brazilian government was, ultimately, his most important patron, and he sided with the ruling power in his country, right or wrong, time and again on the question of the widespread poverty that plagued Brazil for decades. Pelé’s stock answer was that God had made people poor and his function in their lives was to use his God-given athletic greatness to bring joy into their difficult lives. After Brazil’s victory in the 1970 World Cup, the military dictatorship pulled out all the stops to bask in his glow. Pelé was no unconscious actor in this. When asked in 1972 about the autocracy, he responded, “There is no dictatorship in Brazil. Brazil is a liberal country, a land of happiness. We are a free people. Our leaders know what is best for [us], and govern [us] in a spirit of toleration and patriotism.” Keep in mind that when Pelé was saying this, 25-year-old Dilma Rousseff, now the country’s president, was being tortured in a military prison. One wonders if this has ever come up in conversation. Pelé wanted to use this World Cup as his swan song on the international stage. He has released a book and is attempting to cash out while people are still paying attention. The fact that he feels compelled to actually speak out about the carnival of injustice FIFA and the Worker’s Party are creating with the 2014 World Cup only underscores just how deep the crisis remains throughout the country. When you spend billions to host a soccer tournament and people are putting up murals like this on the walls of the country, discontent will boil and steam. Now even Pelé is getting smoke in his eyes.